Virgin Atlantic won't handicap you at check in. Take advantage of travelling to some fantastic golfing locations with Your Golf Travel, as booking flights with us has never been easier. With our partnership with Virgin Atlantic we can send you stress free and happily on your way to great golfing destinations in the USA, South Africa, Dubai, the Caribbean, Mexico, China and even the Ryder Cup in 2020. Enjoy an excellent flight service on board, or treat yourself to an upgrade in Premium Economy or the Upper Class experience. Keep an eye out for many special offers on all flights, accommodation and great golf courses. To plan your perfect golf holiday speak to our dedicated Holiday Specialists now. When you fly Economy you can expect not only great service from the dedicated cabin crew, but other nice things on board too. All meals are complimentary and there is a free bar service as well. 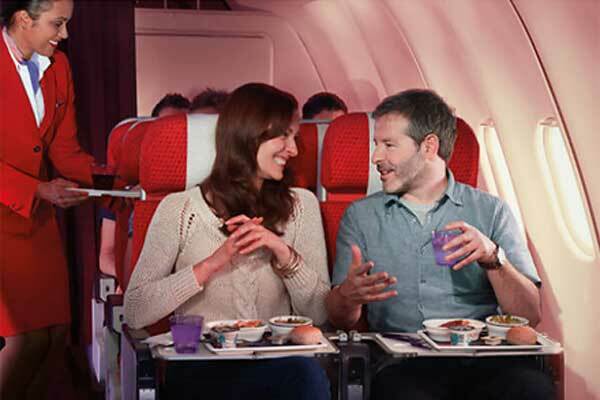 On some flights Virgin offer a movie treat while catering can also be tailored to some specific dieatary requirements that you may have, such as Kosher or gluten free. Did you know you can pick up a free newspaper at the gate on flights from the UK? You can also get a complimentary amenity kit with lots of useful things inside plus goodie bags for kids. The economy seats are comfortable, with adjustable headrests and lumbar supports and moveable armrests. 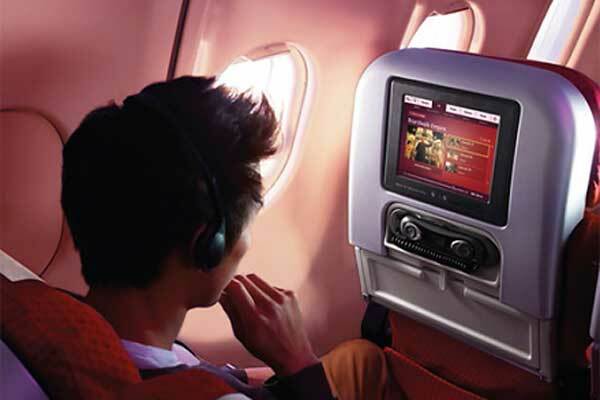 Every seat has its own seatback TV with a choice of channels to keep everyone entertained throughout the flight. On many flights, the seats also come with their own video games console with up to 35 games. In your seat pocket you'll find the Virgin Seatback magazine, packed full of interesting articles and information about the in flight entertainment. You'll also find a Retail Therapy magazine for all those nice Duty Free products - and if you want to order in advance, you can! The newly enhanced dedicated Premium Economy cabin has been designed to give you plenty of personal space. It's a place where you can relax, stretch out and unwind with an increased seat width of 21 inches. Covered in sumptuous purple leather the new Premium Economy seat, is now more luxurious than ever. With ample leg room (the seat pitch is 38 inches) and an additional two degrees of recline, you can happily stretch out and notice the extra comfort. Dedicated Premium Economy Check In, if you haven't already checked in online and dedicated bag drop. Priority boarding and priority disembarkment. On the plane you can relax into your seat with a pitch of 38 inches. A personal seatback TV offering the latest blockbuster movies, the hottest TV shows, video games and up to 14 audio channels ranging from pop to classical. Devoted cabin crew to guarantee prompt and attentive service. A delicious menu served on china dinnerware accompanied by stainless steel cutlery. A selection of fruit from the fruit bowl. And when you land priority baggage reclaim. Get an Upper Class experience with a business class fare and see what all the fuss is about. 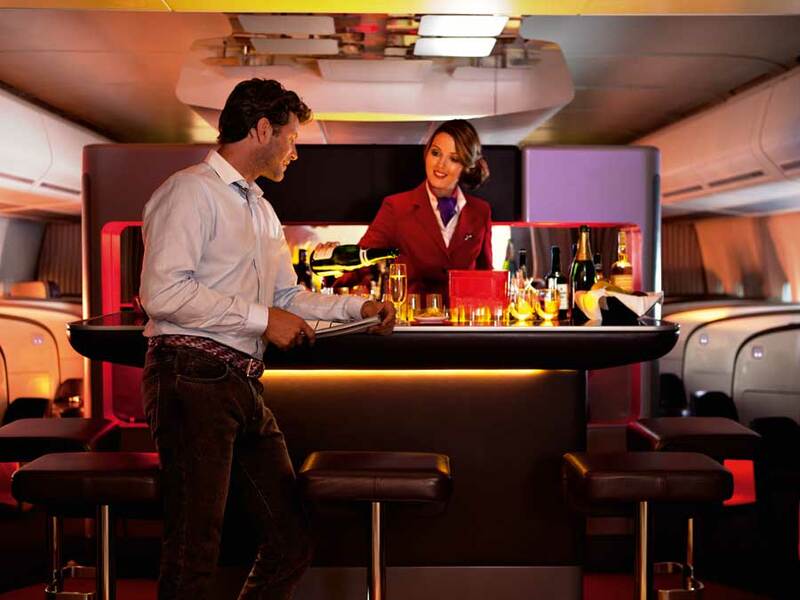 With stunning clubhouses, an exclusive on-board bar and one of the longest fully flat beds in business class, you’ll find it’s a very luxurious way to travel. Whether you arrive by Chauffeur driven car or are checked in at the main terminal, you'll be whizzed through the Private Security Channel and relaxing in the comfort of the award-winning Clubhouse in next to no time. The Upper Class Suite allows you to work, relax, share a drink with a friend or sleep in complete comfort. There's space for storing a laptop - (power access is provided), a generous table for working or eating and plenty of room to put your feet up! Every suite is fitted with a multi-directional 10.4" TV screen with a huge choice of films, TV programmes and games. Perfect for stretching out or curling up and getting your beauty sleep. At 6'6" long/202cm, (or 6'8"/208cm on the upper deck), the Upper Class Suite has one of the longest fully flat beds when compared with other airlines' business class. Across the shoulder, the bed is a generous 33" (84cm) wide. The Upper Class Suite has a 22" (56cm) wide seat. It also has full lumbar support and comes with its own ottoman, which doubles as a seat for a guest. So business can be done with a colleague or a drink can be shared with a friend. The seat flips over to become a fully flat bed at the touch of a button. This allows for the two sides to serve completely separate functions - a fully contoured seat on one side covered in soft leather, while on the reverse the bed is built of firm, highly supportive foams covered in a breathable fabric for maximum sleeping comfort. Book your Virgin Atlantic Holdiay to America, Dubai, Jamaica, Barbados, Cancun, South Africa and many other countries. Excellent service on our Virgin flight and the cabin crew were very attentive. 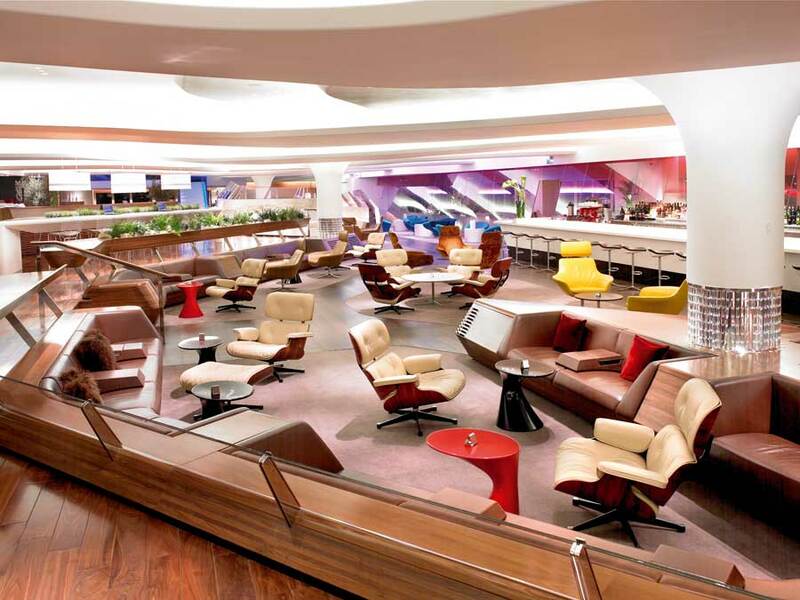 Virgin Atlantic really know how to look after their passengers from start to finish. Premium Economy on Virgin was certainly worth the supplement for our flight to LAX. Seats perfect, flight on time, staff friendly, thank you Virgin Atlantic. My first time in Upper Class on Virgin and I will definitely be doing that again. I felt relaxed and rejuvenated after a very smooth flight, thank you Virgin Atlantic. The Virgin crew looked after us very well considering my wife was a nervous flier. I treated myself to Premium Economy on Virgin Atlantic and it did not disappoint, thank you.